In honor of 30 years on the air, WFAN will celebrate with a special day of live broadcasts from Vanderbilt Hall inside Grand Central Terminal in midtown Manhattan on Thursday, June 22 from 6am to 6:30pm. "WFAN has been setting the standard for sports talk and information since its inception. As we celebrate 30 years, we are so very proud of our entire on-air and behind-the-scenes teams both, past and present, who have worked tirelessly to deliver live and local sports content that continues to make a difference for our advertisers and listeners," said CBS Radio New York Senior VP/Market Manager Marc Rayfield. OM Mark Chernoff added, "We are proud to be a part of the fabric of New York sports. WFAN has wonderful, appreciative and engaged listeners who are the backbone of the station, as well as leading talent, that together allow WFAN to achieve groundbreaking success and have helped the station become an institution in the Big Apple. It is no coincidence that the station is nicknamed 'The Fan,' acting as a mouthpiece for die-hard sports enthusiasts." Over the past 30 years, WFAN has been anchored by marquee personalities such as Mike Francesa and Boomer & Carton, whose programs consistently are the #1 ranked radio shows in the #1 radio market with the station's target audience of Men 25-54. In addition, WFAN is heard by almost two million people each week, making it the most listened to sports radio station in America. WFAN and the first sports format station in the nation launched at 3:00 p.m. on July 1, 1987, Emmis Communications-owned WFAN signed on at 1050 kHz, replacing country music station WHN. The WFAN call sign was suggested by the wife of "The Fan's" first program director, John Chanin. 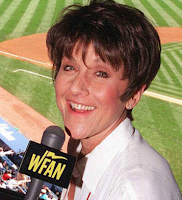 The first voice heard on WFAN was that of Suzyn Waldman, with a sports update, followed by the first show, which was hosted by Jim Lampley. Waldman reported for the station, covering the New York Yankees and New York Knicks for 14 years. Other hosts besides Lampley during WFAN's fifteen months at 1050 kHz included Bill Mazer, Pete Franklin, Greg Gumbel, Art Shamsky, and Ed Coleman. Ann Liguori is also one of the original hosts and was the first woman to host a show on the station. "Hey Liguori, What's the Story" aired the first weekend the station was on the air in 1987 and continued until 2008. WFAN also inherited broadcast rights to the defending World Series champion New York Mets from WHN, who had held the rights for several years. In early 1988, General Electric, which now owned NBC through its purchase of RCA two years earlier, announced that it would close the NBC Radio division and sell its stations. In February of that year GE made a multi-station deal with Emmis and, in New York City the WNBC license for 660 was included in the sale. On October 7, 1988 at 5:30 p.m., WFAN moved down the radio dial to replace WNBC at 660 kHz. The last voice heard on WNBC was that of Alan Colmes, who said these final words to close the station: "I'm Alan Colmes. Thank you, God bless you, and for the last time, this is 66 WNBC New York City. Let's do the countdown." He then counted down the seconds to WNBC's demise with the legendary NBC chimes (the notes G-E-C) playing in the background. After 66 years, the long history of NBC radio in New York City had come to an end. In the complicated switch that saw WFAN move to the 660 frequency, the 1050 frequency that was formerly the home of WFAN became that of Spanish-language WUKQ, owned by Spanish Broadcasting System. However, SBS already owned an AM station in the market, Newark-based WSKQ at 620 kHz, and in those days FCC rules stipulated that companies could own only one AM station per market. As a result, SBS received a temporary waiver to run 1050 while exploring the sale of either AM frequency. SBS chose to keep 620 (it is now WSNR), and 1050 was traded to Forward Communications, which owned WEVD, then at 97.9 FM. After that deal was approved, WEVD's call letters and programming moved to 1050 AM (it is now WEPN and ironically, it is also a sports station), and SBS took over 97.9 as WSKQ-FM. The October NBC-Emmis switch also saw Emmis's WQHT (then at 103.5 MHz.) move to 97.1 MHz., which had been the home of NBC's WYNY. Emmis sold the 103.5 frequency to Westwood One, who also acquired the WYNY call letters and its country music format. TWH Press Briefings Called "Kind of Useless"